Movement at the station – light rail for Byron Bay? Plans to start preparatory work for a local light-rail service are now before the Byron Shire Council . The Elements resort, on the old Club Med site near Byron Bay, has lodged a development application for rail platforms and a storage shed. It wants to run a service linking the resort and the town centre. Mayor Simon Richardson said it was a welcome proposal. “It’s predominantly the development application for the storage shed that would house the locomotive and also a platform at the Bayshore Drive end and another platform at the Byron end,” he said. “So this is a sign that there really is movement at the station. “I think any opportunity to use the rail corridor to provide a transport option for the public is a positive, and it shows that the lines can be utilised for decent-sized public transport and visitor transport options. A plan to run rail-bikes along the abandoned tracks from Bangalow to Byron Bay has received enthusiastic support from Byron Shire mayor, Simon Richardson, who posed for promotional pictures in Byron Bay on the weekend. A written proposal is now being prepared for the Casino to Murwillumbah rail trail. It comes after the recent announcement from NSW Trade & Investment, which is calling for expressions of interest (EOI). 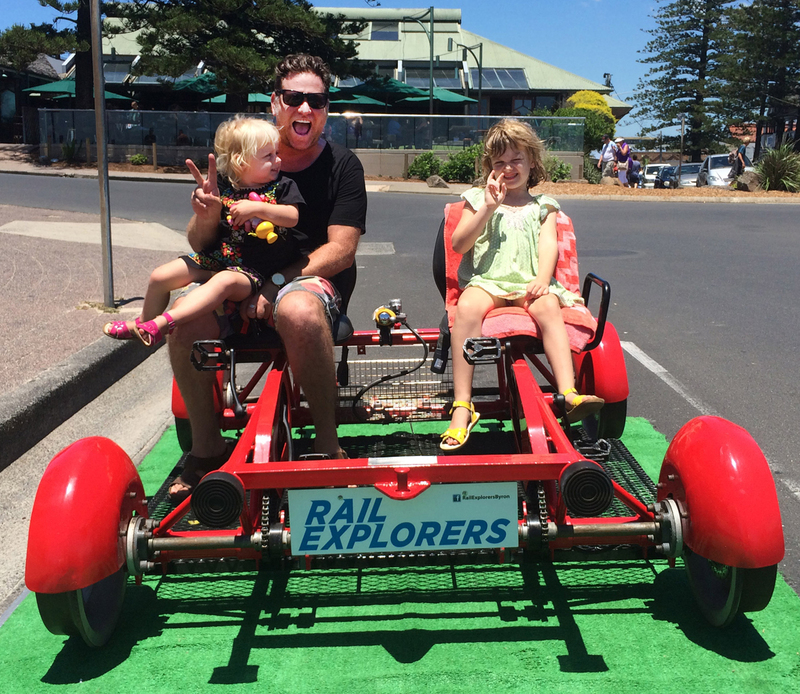 Mary-Joy Lu and Alex Catchpoole from Rail Explorers say they have been working on their pedal-powered rail-bike proposal for the past two years and last weekend put their rail bike on display in Byron Bay. They said close to 400 signatures of support were collected; they aim to preserve the tracks between Bangalow and Byron and build a rail trail beside the tracks. He says they are investigating how difficult it would be and how expensive it would be to build the trail next to the tracks in this area. MAINTAINING the rail line alongside a rail trail is unlikely in Byron Shire, according to councillor Sol Ibrahim – despite mayor Simon Richardson’s vow he would only support proposals that kept the tracks intact. Byron Shire Council has previously passed a resolution that fully supported the rail trail inclusive of, where feasible, a “multi-modal corridor” allowing for rail-based transport options. Cr Richardson said his policy was keeping the tracks in place to allow a future light rail service. He predicted such a system could be built from Bangalow to Yelgun for as little as $15 million, based on an extrapolation of the $300,000 per km costing done between Byron station and the North Byron Beach Resort site. “If it only costs 10% more to have both (light rail and a rail trail), isn’t that worth it for our community?” he said. Cr Richardson said there was “huge interest” from private operators keen to create rail-based tourism products on the existing line. The problem, according to fellow Byron councillor and rail trail supporter Sol Ibrahim, is that it’s mostly “not feasible” to keep the tracks. Cr Ibrahim labelled the mayor’s calculations on a $15 million light rail system “primary school maths”. He said the state of the tracks was deplorable and riddled with engineering challenges. “There are some places where there the cuttings have washed out and the tracks are hanging in mid-air,” he said. Cr Ibrahim said the service proposed between Byron station and the North Byron Beach Estate site was the most pristine stretch. “It’s flat, there are no cuttings, no culverts, no underpasses or overpasses … and $3 million is being invested on a tram that’s going to do 20km an hour,” he said. Cr Ibrahim said discussions over public transport in the rail corridor were now defunct, because the NSW Government had moved on. “This government will not consider this rail corridor for public transport … it’s just as simple as that,” he said. The cover of the Tasmanian Greens’ rail trail policy. A PROMOTIONAL pamphlet for a rail trail along a disused rail line in northeast Tasmania came across the desk of The Northern Star newsroom recently. In bold capitals on the front of the pamphlet it was proudly printed that the rail trail was a policy initiative of the Tasmanian Greens party, whose slogan is ‘Tasmania: Create Our Own Future’. The initiative promised to “boost sustainable tourism” by showcasing the northeast region of Tasmania to a new breed of tourists. It pointed out recreational cyclists were a “high yield, high-spending market”, bringing “enhanced economic and social opportunities” to the region. The pamphlet also suggested that rail trails drew tourists away from their usual haunts and sent them to towns they might otherwise not visit. The pamphlet echoes what those who back the Northern Rivers Rail Trail concept want to do here. But unlike their Tasmanian colleagues, Northern Rivers Greens, at both local government level and among the candidates running for state election next year, are guarded about supporting it. Byron Shire Greens mayor Simon Richardson, who voted against a recent motion to “fully support” the trail, said Byron Shire residents, who suffered under the weight of 1.4 million visitors each year, deserved more than a “bike path” alone. Cr Richardson argued that a light-rail service running from at least Bangalow to Mullumbimby with an occasional extension to Yelgun during festival periods could be viable alongside a rail trail. “If we can ride on the back of tourism numbers and get some subsidised public transport use, I think that’s a great outcome for our shire and well overdue,” he said. The mayor said he would be introducing a motion at Byron Shire Council’s next meeting calling on Ballina MP Don Page to formalise a committee to cost the envisioned light-rail service. In Lismore, Greens councillor Vanessa Ekins said she didn’t want to see “tracks covered over or destroyed in the process of creating the rail trail”. She added the rail trail wouldn’t have any impact on her pet hate: the large number of cars travelling every day between Ballina and Lismore. “A lot of the rail stuff is about tourism, I’m much more interested in commuter transport options,” she said. Greens candidate for Ballina Tamara Smith said she thought the rail trail was a “wonderful” idea but not at the expense of the possibility of light rail in Byron Shire. “My position is the (Byron Shire) multi-use model is ideal,” she said. While some are suspicious of a rail trail, fearing it would mean the end of trains forever, organisations such as Trains on Our Tracks believe the train is a viable transport solution and the government is basically lying about the $900 million cost. However, Northern Rivers Rail Trail secretary Steve Martin said a rail trail would secure the corridor in public hands and allow trains to be reintroduced in the future if deemed viable. But he did note that, for now, the government had moved on. “They’re talking about funding a rail trail, they’re not talking about funding a rail service,” he said. A NSW Greens MP says Byron Shire Council’s close vote last Thursday to support a rail trail thereby weakening protection for the railway corridor is not a green light for the controversial $75 million Northern Rivers Rail Trail proposal. Dr Mehreen Faruqi MLC, the Greens’ transport spokesperson, says the closeness of 5-4 vote (progressive councillors Simon Richardson, Duncan Dey, Basil Cameron and Paul Spooner against) not only weakens the corridor protections but jeopardises future public transport for the northern rivers. Ironically, Greens defector Cr Rose Wanchap voted with the pro-development faction. ‘The government has said that it would only pursue a rail trail if it had broad community support and the closeness of the vote shows that this is far from the case,’ Dr Faruqi said. ‘To say that a rail trail would preserve the rail corridor is incorrect. The reality is NSW already has the strongest protections for rail corridors of any other state. ‘The $70 million earmarked to rip up the rail line would be much better spent on real transport solutions for this burgeoning region. ‘The community rightfully want commuter transport that connects large regional centres to other cities and towns. ‘Converting the Casino-Murwillumbah line to a rail trail would be a death knell to any hope for public transport solutions that are desperately needed in Byron Bay and the northern rivers region. ‘Rail trails can be great for recreation and tourism purposes in some circumstances, but not at the expense of essential regional public transport services. ‘We should be reinstating regional rail services as a priority and building rail trails alongside them,’ Dr Faruqi said. A train could be pulling into Byron Bay station again as early as next year. But don’t expect to see one at Lismore or Murwillumbah any time soon. That was the message of a meeting convened by Byron mayor Simon Richardson at the Byron Community Centre last night. Cr Richardson was quick to point out the council had no role in deciding which projects would get the green light from the state government, apart from advocating on behalf of its constituents. The three speakers spruiking advanced projects looking at ways to use the line all impressed on the 200-odd attendees that the key to getting things moving on the line was tourism. Two of the projects would involve short-distance commuter transport and two would offer self-drive buggies running on the existing rails. All agreed that substantial work and significant expense was required to bring the lines back up to scratch, with the Bangalow to Byron section alone estimated to cost $1.5 million. The most ambitious proposal, which includes both ‘ultra-light’ rail and self-drive on-track buggies, would maintain and use almost the entire stretch of track in Byron Shire, from Bangalow to Yelgun. All three groups said their projects were compatible with a rail trail concept along the full length of the old Casino to Murwillumbah line. Mayor Richardson took on the role of speaking on behalf of the first proponent, Jeremy Holmes of North Byron Beach Resort. The company has been in advanced discussions with the state government over its plan to run a renovated rail motor, twice hourly from its site via West Byron shops and tavern and the Arts & Industry Estate to Byron Bay station. ‘The resort’s owners would fix and manage the track, including the bridge over Belongil Creek, at their own expense,’ he added. ‘They are looking to renovate it so that it will run on solar power,’ he said. ‘If you sit in a queue on Ewingsdale Road at the moment, look at your watch and wait for 30 seconds, the car in front of you probably hasn’t moved very far,’ he said. Cr Richardson said the resort owners already had initial approval from the NSW Government and expected final approval ‘in six to nine months’ for ‘non-exclusive’ use of the line’. 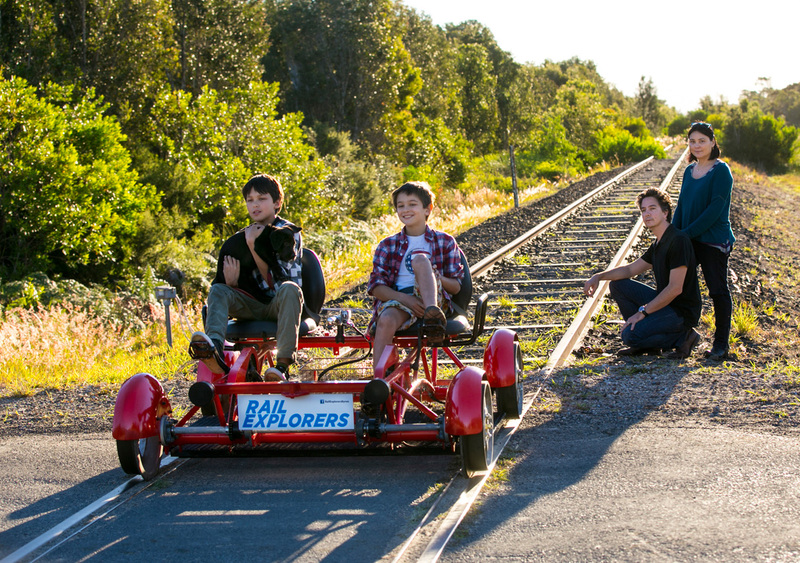 The Rail Explorers group, headed by Alex Catchpoole and Mary-Joy Lu hopes to tap into the shire’s appetite for community involvement with its plan to launch up to 100 pedal-driven ‘rail bikes’ on the downhill Bangalow to Byron Bay stretch of the track. The plan is modelled on a successful venture in South Korea, which sees groups of two-to-four people pedalling the open sided vehicles along one of the most picturesque stretches of the line. The quad bikes would be pedalled in one direction only, with a tour bus taking patrons up to the Bangalow start of the line. The bikes would be towed back up the hill by a high-rail vehicle (a modified road vehicle) initially and later by a light-weight diesel passenger train. ‘We want to be profitable and partner with the community in a social enterprise,’ Mr Catchpoole said, adding the group would be happy to give way to light rail after five years if that could be shown to be feasible. He said the group would be responsible for the upgrading of the track and Bangalow station. Locals would be welcome to ride on the shuttle bus for a small fee, he said. At a one-way price of $45-$50, Ms Lu said the group envisaged a significant return to the community after the second year, based on a 30 profit share of revenue from an estimated 50,000 passengers. An audience member who identified herself only as a ‘fellow eco-tourism provider’ said she liked the scheme but questioned the numbers, suggesting they were ‘optimistic’. But the most ambitious plan of all came from two New Zealanders, who are already running a similar system on an old stretch of rail line in Rotorua. 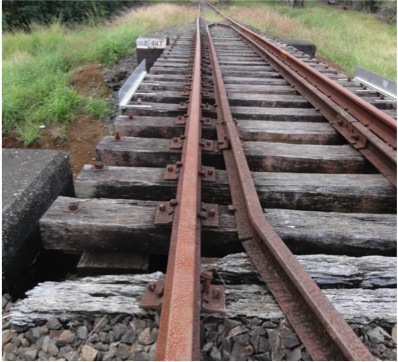 Spokesperson Neil Oppatt said the group would restore and maintain the entire track from Bangalow to Yelgun, running a combination of powered self-drive buggies and ‘ultra-light’ rail vehicles carrying up to 40 sitting passengers. The line would be divided into three sections: Bangalow to Byron; Byron to Mullumbimby; and Mullumbimby to Yelgun. Passenger ‘ultralight’ services would run up to twice hourly from Byron Bay to Bangalow and Mullumbimby. 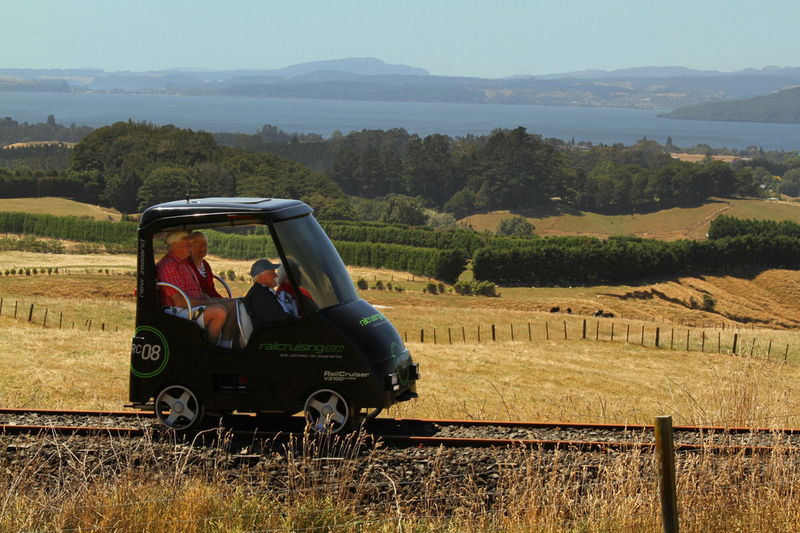 The self-powered four-seater rail cruisers would also run on the Bangalow to Byron and Mullumbimby to Yelgun sections of the route. Mr Oppatt was at pains to point out the company’s experience in building and maintaining rail lines and the vehicles that will run on them. ‘We will build our 40-seater trams and four-seater cruises from our factory in Coffs Harbour,’ he said, adding they are cheap to construct and their light weight keeps the cost of line reconstruction and maintenance to a minimum. He added the company was in the middle of presenting a similar proposal to Coffs, Belingen and Dorrigo shire councils for another abandoned stretch of rail line in those three shires. ‘We can run the ultralight tram and the cruisers over the same track with a maximum speed of 20km/hour,’ he said, adding he expected costs would be ‘about the same’ as the company’s current route in New Zealand. There it charges $76 per person for the cruisers and $190 per family. He said the tram would like cost $15 one-way and $20 return from Byron to Bangalow or Mullumbimby. Queenslander Peter Finch is hoping to be able to cut through the battle between locals who want to see trains back on our tracks and those who would rather have a rail trail. The creative media student and vintage tram enthusiast believes a volunteer-run light rail service, along the lines of Melbourne’s Puffing Billy or the ill-fated Zig Zag Railway could work in Byron Bay. He plans to put his ideas to a community meeting at Byron Community Centre this week. While Mr Finch readily admits he doesn’t have funding or a feasibility study in the bag, he does believe that Byronians will embrace the alternative to ‘a big, dirty old diesel rail car’, which is one proposal currently on the table. But lack of funding doesn’t faze Mr Finch, who says he put similar proposals to the Queensland Government in the 1990s. ‘I did a proposal in when the Queensland Government was looking at doing light rail in Brisbane over some of the old rail lines,’ he told Echonetdaily. 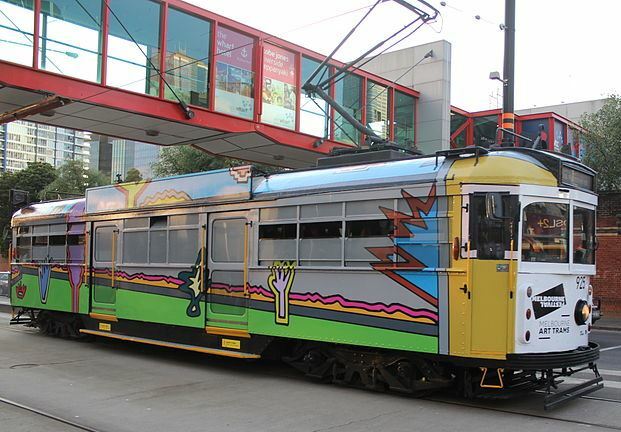 ‘My suggestion was that they could use the old trams that used to run in Brisbane. ‘I met with the minister and also did a proposal for the mayor, and they were very keen, but there was an issue with the gauge of the track,’ he said. Mr Finch has coined the term TramLink for his Byron Bay plan, and says that if it wins council support he would look at putting together ‘a consortium of people’ who are interested in public transport and ‘something more environmentally sound than some of the suggestions going around at the moment’. He added his option would be compatible with a rail trail. ‘The rail trail could work in with a tram service with trams taking bikes from Byron Bay to Mullumbimby or Bangalow for further exploration in and around those towns, Mr Finch said . ‘The track is not in as bad condition as the ARUP report puts out and the costings are two or three times the amounts that other states seem to go on,’ he told Echonetdaily. Mr Finch envisages a staged process that would see a tram operating from the from the Services Club near Browning Street in Byron Bay to Mullumbimby with a stop at Tyagarah to service Bluesfest patrons. He added that route extensions could also serve Suffolk Park and ultimately Bangalow, which he said Byron Shire Mayor Simon Richardson was particularly keen on, although he did concede the track to Bangalow would need a significant upgrade to be viable. Mr Finch said while the state government was unlikely to come to the party given the ARUP report, there were other sources of funding that could be tapped for the project. ‘Firstly it’s about the people of Byron being able to use it as a viable transport service. Secondly, it’s about the 1.3 million visitors and tourists to the area each year,’ Mr Finch said. ‘The ARUP report only looked at satellite images and track that was visible from the road,’ he said. ‘It does need a lot more further study,’ he admitted. A Critical Conversations forum will discuss options for the future of the Byron section of the Casino to Murwillumbah rail line at Byron Bay Community Centre on Thursday July 17 from 6.30pm. 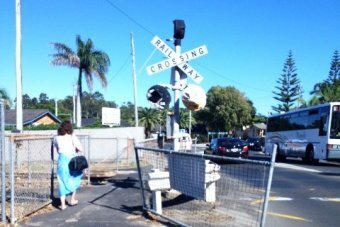 It has been welcomed by rail trail enthusiasts, but condemned by those wanting light rail: a state government-commissioned study released Friday gives a strong case for a regional rail trail but suggests removing existing track to accommodate foot and cycle traffic ‘in a majority of locations’. Consultancy company Arup were commissioned after the Casino to Murwillumbah Transport Study was released in 2011. But that study, which cost an astonishing $2m and totalled 130 pages, inexplicably omitted light rail as an option, only surveyed a small percentage of the entire line, bloated costs and estimations which were at odds with previous studies and largely ignored Byron Bay’s traffic congestion and exceptionally high tourist numbers. And while the state government and rail contractor John Holland refused to disclose to The Echo the cost and quality of rail maintenance work – if any – being undertaken in the area, the new rail trail study claims that there is an ‘approximate annual budget of $750,000 allocated for the purpose of maintaining the corridor’. The report suggests removing the existing track to accommodate foot and cycle traffic, dashing the hopes of the line co-existing with light rail. ‘In a majority of locations,’ the report says, ‘the removal of track, sleepers and ballast material will be required, where a trail cannot be economically formed adjacent to the existing line and remain within the existing railway corridor boundary’. But it’s not all bad news; the study says, ‘Byron Bay forms the focal point for the rail trail and it would be logical to consider Byron Bay as the starting point for the rail trail development.’ Additionally, the ‘section from Murwillumbah to the shire boundary at Yelgun could be timed for delivery to coincide with a similar progression north from Byron Bay’. Northern Rivers Rail Trail Inc has supported the move, with spokesperson Marie Lawton saying it confirmed the trail would ‘create strong benefits for the northern rivers region and that the project is likely to be viable’. ‘By developing a cycling, walking, horse riding trail along the disused railway corridor, the community and visitors to our region will be ensuring the whole corridor is kept in public ownership for our future population,’ she said. But Greens NSW MP and transport spokesperson, Dr Mehreen Faruqi, slammed the study, describing it as ‘a blatant exercise in justifying a pre-determined outcome’. ‘Converting the Casino-Murwillumbah line to a rail trail would be a death knell to any hope the northern rivers would have access to the same levels of public transport as other areas of New South Wales. ‘The estimated cost of the rail trail will be $75 million which comes to around $600,000 per km. Railway lines in regional Victoria have been reinstated at half the estimated cost per kilometre of this rail trail. ‘These funds should be used to reinstate the railway line, starting with the Casino to Lismore leg, not tearing up vital infrastructure. ‘The report suggests that the rail trail would attract 97,000 visitors a year based on a comparison with the Murray to Mountains Trail in northern Victoria. What the report fails to mention is that towns along this trail such as Chiltern and Wangaratta have functioning railway stations. ‘At the end of the day, despite what this report claims, a bike trail cannot be a replacement for public transport for the population centres of the north coast,’ Dr Faruqi said. Surprisingly the report supports the proposal put forward by residents’ group Grab The Rail, which is at odds with mayor Simon Richardson’s advice and position. 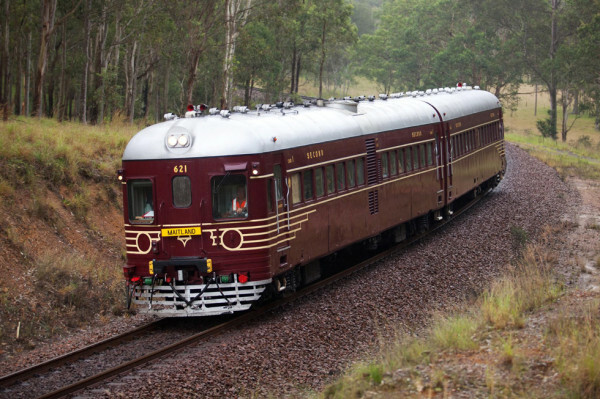 Queensland-based coal mining baron and owner of the North Byron Beach Resort, Brian Flannery, has plans to establish a railmotor service ‘between the existing Byron Bay station and the proposed North Byron Beach Resort located to the north of Bayshore Drive’. Entitled ‘Byron Bay Community and Tourist Rail Shuttle’, the report says that as the corridor width is ‘generous’, it will ‘likely allow for both rail and trail to co-exist for the majority of the proposed operating route’. While federal and state government grants are identified to help fund the project, the ‘formation of partnerships with business and industry is considered vital to the ongoing viability of the rail trail’. Remarkably, the report, authored by James Robinson, suggests that the northern rivers region partner with its ‘emerging gas industry’. ‘For example BHP Billiton contributed over $200,000 to the Victorian Coast to Crater Rail Trail.’ But local state MP Don Page (Nationals) told The Echo, ‘The rail trail will be in no way coming from anything to do with gas. It will be funded by state and hopefully federal government. As for ongoing funding, the report suggests reallocating the $750,000 of ongoing maintenance funding, ‘until such times as the rail trail derives sufficient income and funding revenue from other areas’. A snap action rally is planned this Wednesday morning from 9am at Don Page’s Ballina office, and will include TOOT (Trains On Our Tracks), Northern Rivers Greens, Northern Rivers Guardians. The Casino to Murwillumbah Transport Study and the Casino to Murwillumbah Transport Study Conditions Assessment that informed it have just been released and are devastatingly short sighted regarding costs and future use. Firstly, the overall cost has been put at just over $900 million. To put that in a wider context; the cost of the Tintenbar to Ewingsdale tunnel and upgrade is around $860 million for less than 20 kms. The rail line is over 130 kms long. The costings proposed for upgrades beggar belief. The Byron to Mullum section serves as a great case in point: it was costed at $202 million, with level crossing costs put at over $5 mill. The upgrading of small culverts alone were costed at over $18 mill, even though the assessment report also admitted only 15% of culverts were inspected. Infact, incredibly, only 30% of the Lismore to Byron Bay section of the track and 20% of the Byron Bay to Mooball section were viewed! Within the assessment report annexures, the inspection reports focusing on each section were left blank. Aside from the problematic costings, the overall future use considerations were visionless. The use of the line by visitors was dismissed, the report stating, “public transport is unlikely to compete with private vehicle and private bus operators that service the needs of visitors on a mostly, ‘user pays basis.’ The study simply looks at the rail as a way to get from A to B, it overlooks that visitors may use it for an experience. What visitor who stays for a few days wouldn’t take a day trip on a train through the hinterland? It would quickly become the thing to do for all families and couple visiting the area. It could be volunteer run and feed the dozen or so festivals along the line, the markets on weekends. Certainly for weekends and holidays at least, it would be successful. I just returned from Victor Harbor; there they have a volunteer run train journey using beautiful old carriages on weekends and holidays, there are countless other examples. To not even mention this aspect is willfully ignorant. Maintenance grinding and ultrasonic testing will be required to ensure there are no internal defects. The rail line has a total of 164 Underbridges (rail bridges over roads, waterways and flood plains), having a total length of 5.5 km. Timber bridge structures, currently make up approximately 75 percent of these. All timber Underbridges inspected are in poor condition with significant deterioration of elements through splitting, dry rot or termite damage. All have been classified as category 3 (major maintenance required) or category 4 (full replacement or renewal required). Rail collision of piers for a road over rail bridge. Vehicle collision with piers for roads under rail bridge. Sufficient height clearances for traffic. Evaluation of flood immunity of structures. It was found that 20 percent of culverts have minor structural damage that requires remedial works, and 10 percent are expected to require replacement. Since the closure of the rail line, at least three significant landslides have occurred that directly impact the track. The entire St Helena Escarpment between Bangalow and Byron Bay (~3km long) is a location of existing slope instability. Extensive remedial works are required to stabilise the slopes. Most large embankments (>4 m high) show signs of localised settlement, erosion and loss of ballast, and require embankment repair and additional ballast. Generally all operating line components on the CRN network are subject to a Technical Maintenance Plan in accordance with JHR CRN Engineering Standard26. With regular scheduled inspections the condition of the line can be monitored, and appropriate preventative maintenance can be carried out. For the disused Class 2 Casino to Murwillumbah line, no current maintenance or asset condition information is available. Only limited information from previous inspections is available. In order to re-establish a thorough understanding of the asset condition of the components in this rail corridor, all line components will require a detailed assessment.